What a fantastic, everyday reminder. For the last few months we have had a Noel Christmas art I made above our piano in our living room but realizing that it is now March, I knew I should probably get my act together and make up something new for that prime real estate. Behold the new sign. After much research on Pinterest and trying to gather inspiration for our new wall decor I found a similar sign I loved from Blooming Homestead that I knew would be easy to duplicate based on the supplies I already had on hand, so I went to work. 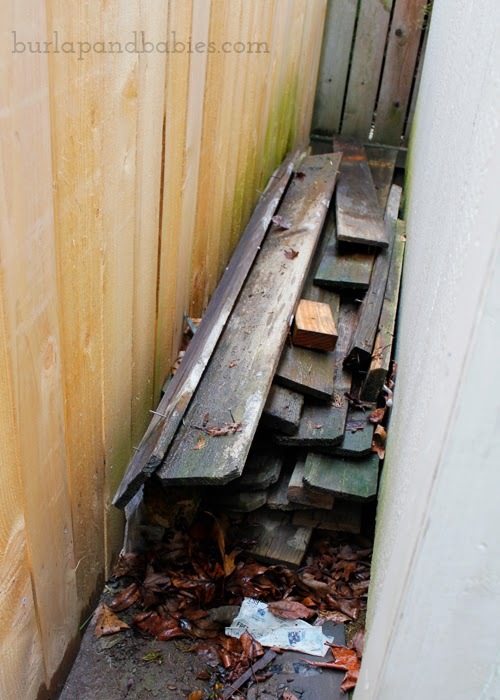 Last summer when we moved into our home, a portion of our fence had to be replaced immediately and, luckily, mr g allowed me to save those fence boards behind the shed knowing one day I would have a good use for them. 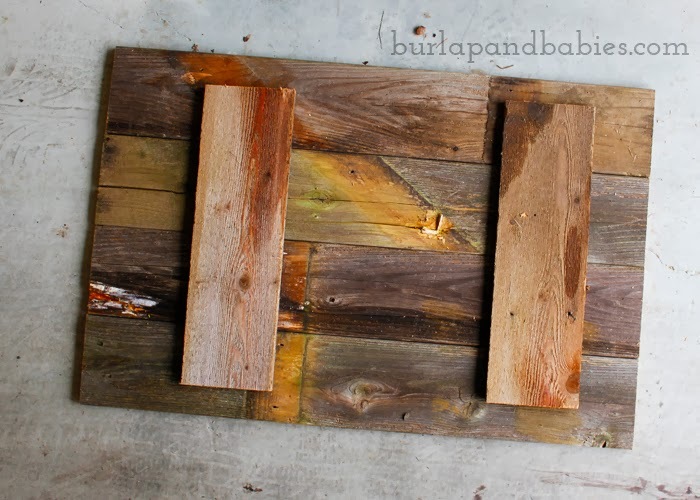 So last weekend I took four of those boards and put them in the garage overnight to dry out….since we do live in Oregon and it tends to rain about half the days out of the year and of course they were soaked. After a night of drying out, we started by measuring out the approximate length of our sign we wanted based on the piano width and then I had mr g cut them to the right size using a miter saw. And since we’re friends here, I’ll tell you a secret, he actually only measured one board and then just held that one up to the others to measure. 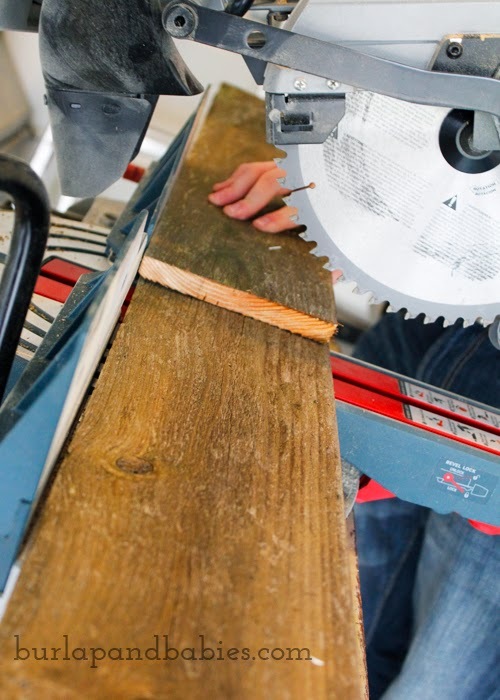 Once they were all cut, he used the scraps from the boards to make cross pieces to hold all the boards together using a micro pinner — aka a power nail gun is what I call it. 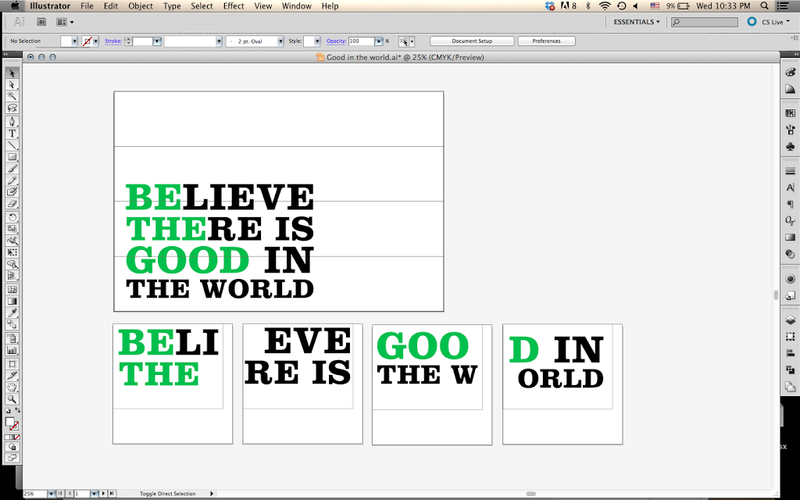 Once that was all done it was time to make my letter outlines. I first designed what I wanted it to say and look like in Adobe Illustrator. You could design it directly in Silhouette but I work better in Illustrator and then I was easily able to divide up all the text into 8.5×11 sheets prior to opening it up in Silhouette software so then it was quicker to cut. For me it was just easier, but you can do it either way. 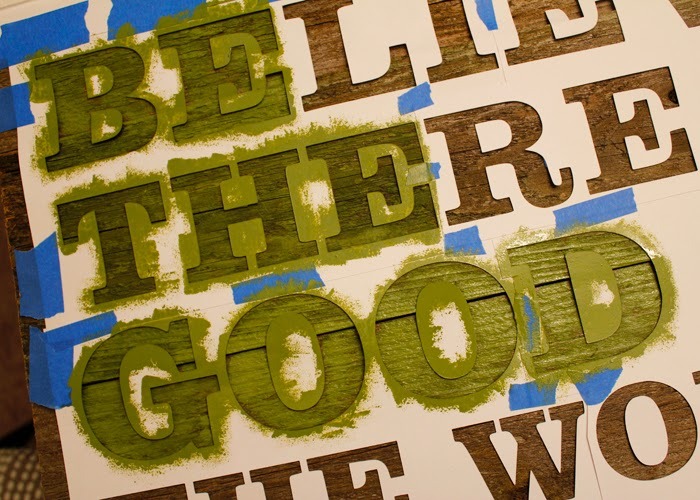 Once I had the files saved as an svg file and opened up in Silhouette, I then was able to use my handy dandy Silhouette Cameo to cut out the letters in cardstock which I then taped to the boards. 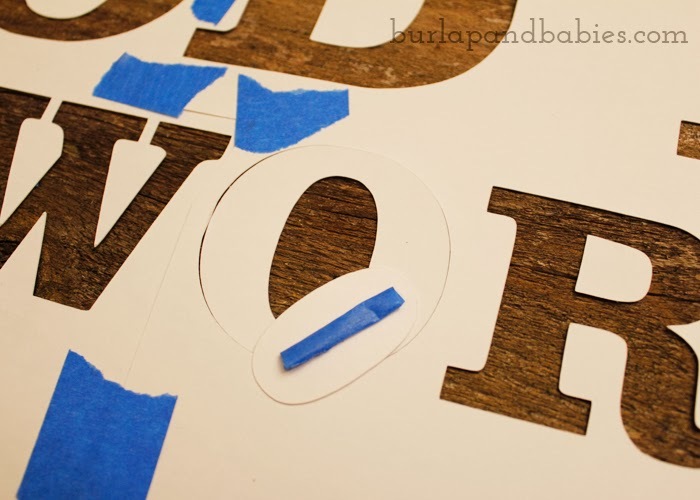 As you can see, be sure to keep the middle parts of the letters if you cut your own letters out because you will need to tape those in place. I found it was easiest to rebuild the whole letter again on the board but only put tape on the middle piece (technically called a “counter”).Then you can remove the negative piece and it will be in the perfect right spot. From there I used up about half a roll of blue tape making sure everything was held down nice and snug and then went to town using a foam brush to paint my board. I used leftover green paint from the coffee table updo I did (post coming soon on that) for the sign so everything in the living room goes together well. Remember when I took some items home from an old residents apartment and came home with a lamp for my shelves? Well I also got a giant frame that I put to good use. 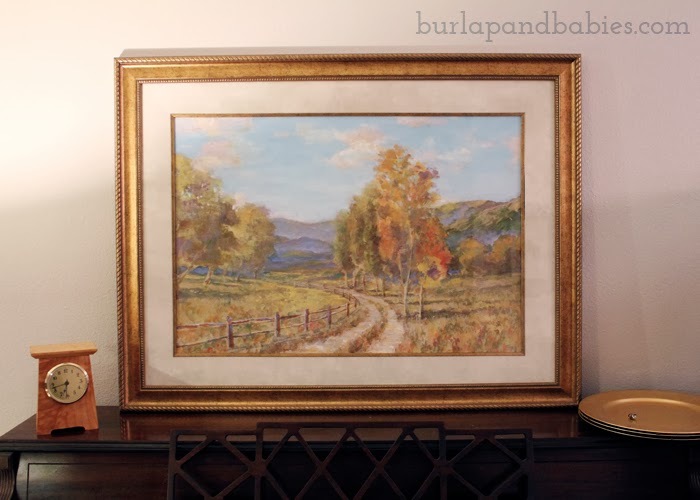 The picture was very old and outdated and I had no intention of ever using it in my home but I knew a large, well-crafted, frame like that is rare to find with such a great price tag — free. So I snatched it up before anyone else and I am so glad I did. It ended up being the perfect finishing touch to our fence board sign! After taking the picture apart, I painted the frame using the spray paint from the ampersand and twine balls on the shelves to match and help tie in the piano area more to the living room. To hang the sign we actually used the wire and hooks from the frame and attached them to the fence boards. Then once we had that placed, we just put two small nails up to rest the frame on. As you can see some of the paint bled through the wood, but don’t worry about it. It helps add to the personal, rustic touch. And here’s the final product. I love how it turned out!! And I’m so glad we decided to add the empty frame around it. 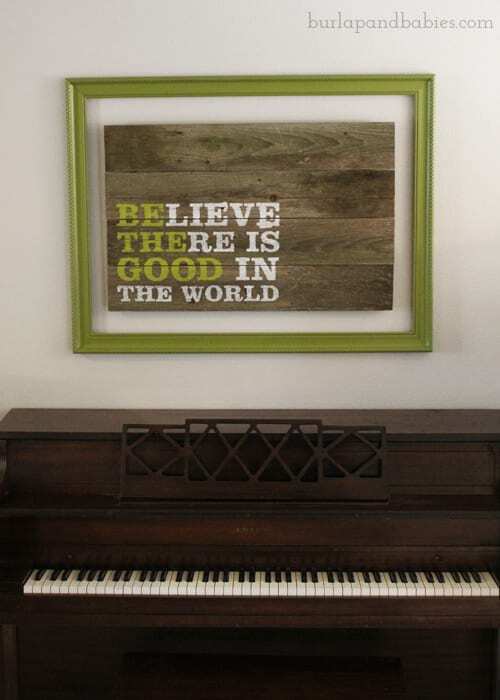 Without the frame, the sign just looked dwarfed above the piano and it really helps bring in some more color to the space. I hope you like it as much as we do!! Stay tuned for a full living room makeover reveal coming your way soon! Amanda, I love your sign it came out so cute!! I love projects like this. Thank you for sharing and the great idea. Looks awesome above your piano! I like the colors you used, too. 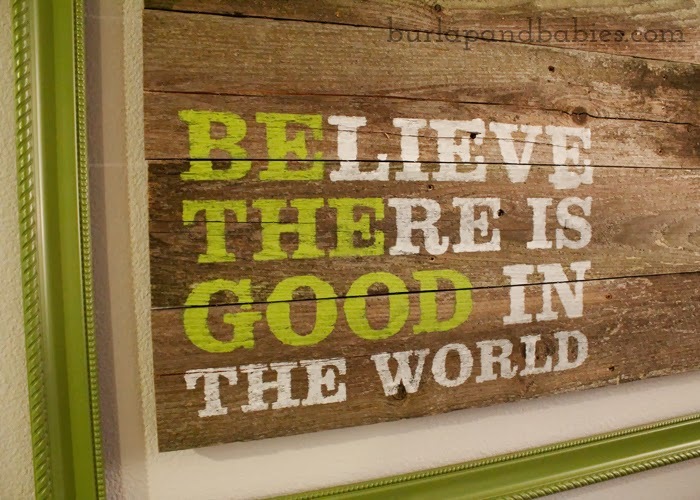 I believe there is Good in the World! love it and pinned it.